CASUAL OPULENCE! 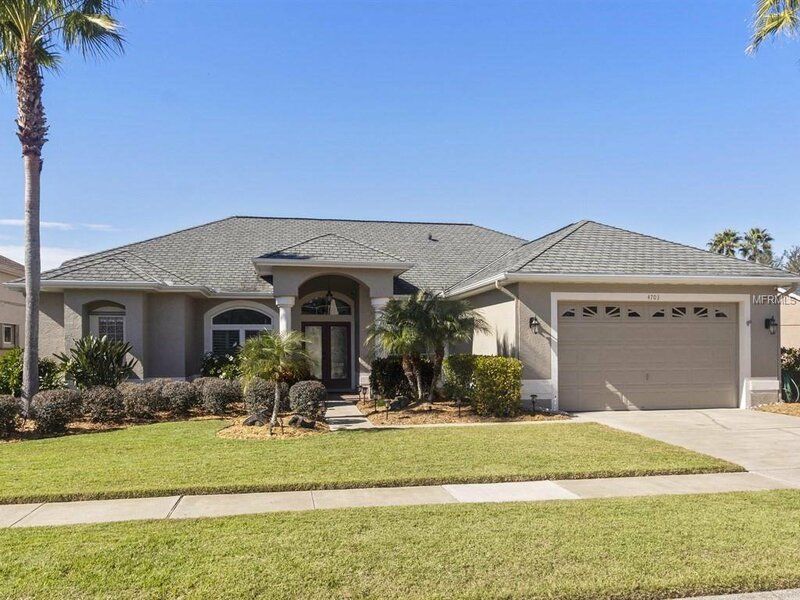 Take one look at this stunning 4 Bedroom 2.5 Bathroom WATERFRONT, pool home and you will fall in love! This GEM features a grand foyer entry, a formal dining room, a formal living room, VOLUME ceilings, crown molding, a split floorplan, and hardwood floors throughout the main living space. The open concept kitchen is an absolute CHEF'S delight boasting SOLID WOOD cabinetry, GRANITE counter tops, under-cabinet custom lighting, top-of-the-line STAINLESS STEEL appliances, an island, large closet pantry, a dinette with a 3-panel seamless window, and so much more. The master bedroom SUITE is sure to IMPRESS offering a perfect view of the sparkling POOL, a LARGE walk-in closet, his & her sinks, a jetted jacuzzi tub, a step-in shower, and floor to ceiling TRAVERTINE tile. The beautiful screened-in salt water POOL featuring an outside shower and pool bath is situated on an oversized .31 ACRE corner lot with MAGNIFICENT fruit trees & landscaping....designed for entertaining! The Community of GLENHURST is located in HUNTERS CREEK...recently named the 21st best place to live in America and offers many parks, activities for all ages, TOP rated schools, and is centrally located to theme parks, the airport, and top shopping destinations! Call TODAY to find out how you can OWN this HOME! Listing courtesy of CENTURY 21 CARIOTI. Selling Office: WEMERT GROUP REALTY LLC.